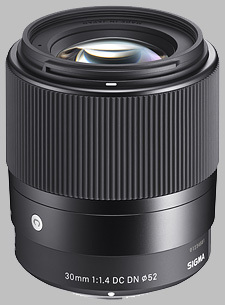 (From Sigma lens literature) Combining outstanding optical performance and compact design, the new affordable Sigma 30mm F1.4 DC DN Contemporary Lens brings immense value to mirrorless cameras. Boasting superior image quality with F1.4 brightness, the versatile lens covers a wide range of photo and video capture scenarios, delighting users with its beautiful bokeh effects. Features 9 elements / 7 groups, Minimum Aperture: F1.6, 52mm filter thread, Minimum Focus Distance: 11.8in, Weight: 9.3oz, Dimensions: 2.6x2.9in. The new Sigma 30mm F1.4 DC DN Contemporary Lens will be available in Sony E-Mount and Micro Four Thirds mount. The Sigma 30mm f/1.4 DC DN Contemporary doesn't have any user reviews yet!